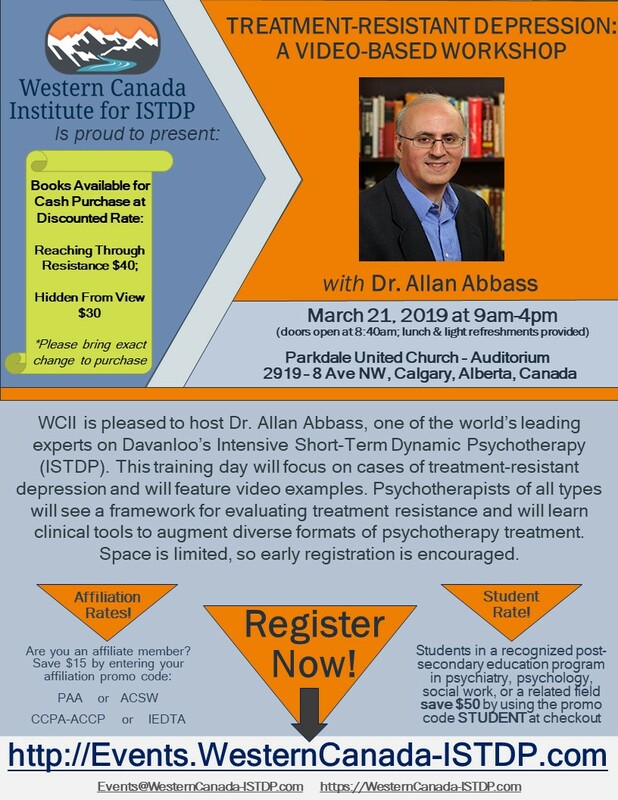 The Western Canada Institute for ISTDP (WCII) is pleased to host Dr. Allan Abbass, one of the world’s leading experts on Davanloo’s Intensive Short-Term Dynamic Psychotherapy (ISTDP). This training day will focus on cases of treatment-resistant depression and will feature video examples. Psychotherapists of all types will see a framework for evaluating treatment resistance and will learn clinical tools to augment diverse formats of psychotherapy treatment. Promo Codes: if you are a member of an affiliate organization, enter your corresponding promo code at checkout for a $15 discount – Promo codes for affiliates are: PAA, ACSW, IEDTA, and CPPA-ACCP; or, if you are a student enrolled in a recognized post-secondary education program in psychiatry, psychology, social work, or a related field, enter STUDENT at checkout to save $50. Books: *Dr. Abbass has kindly offered a discounted rate for his books: Reaching Through Resistance ($40) and Hidden from View ($30). Cash sales; please bring exact change. APA Convention: **Note: Dr. Abbass is the Keynote presenter for the Alberta Psychiatric Association (APA) Conference in Banff on Friday March 22, 2019 – the day after this workshop. He will be presenting on a different topic. If you would like to attend both and make a long-weekend out of it, you may also register for the APA Conference through the APA website (https://albertapsych.org/conference) as an APA or non-APA attendee. Learn ISTDP in Western Canada! Finally! Core Training in Intensive Short Term Dynamic Psychotherapy is available in Western Canada. Located in Calgary, Alberta, we bring the ISTDP trainers to you so you can learn closer to home. The current 3-year Core Training with Jon Frederickson, MSW, author of Co-Creating Change: Effective Dynamic Therapy Techniques, and Diane Byster, LMFT, is underway. If you are interested in joining our current cohort or taking part in a future cohort, please contact us at Events@WesternCanada-ISTDP.com to express your interest. Founded in 2012 by an enthusiastic and committed group of ISTDP-trained clinicians, the Western Canada Institute for ISTDP (WCII) has developed a strong and growing community of local ISTDP therapists and students in Calgary and Western Canada. As an organization, we are committed to supporting students throughout their Core Training with Study Groups, Peer-Supervision and annual Supervision Days with visiting master ISTDP trainers.